Torturing children is appropriate–indeed for their own good–when they misbehave. Nanny McPhee comes to teach the Brown children five lessons: to go to bed when they are told, to get up when they are told, to get dressed when they are told, to listen, and to do exactly as they are told. In other words, adults define what appropriate behavior is for children, and punish children for stepping outside of their roles. This is illustrative of oppressive power dynamics beyond age. The Brown children use what little power they have to misbehave and get their father’s attention. When the children fake sick and refuse to get out of bed, Nanny McPhee uses her magic to bind the children to their beds and make them feel physically ill. She forces them to take foul tasting medicine. Limiting a person’s movement, creating feelings of illness, and force-feeding constitute torture in my opinion. The Brown family’s illiterate scullery maid, Evangeline, is secretly in love with Cedric. She loves the Brown children, and appears to be the only adult in the film who spends time listening to the children prior to Nanny McPhee’s arrival. Cedric’s family is supported financially by Aunt Adelaide, his dead wife’s aunt. Adelaide insists that Cedric must marry by the end of the month if she is to continue supporting the family. Cedric can’t support a hired staff or afford his large home on his mortician salary, so he must do as Adelaide wishes. Adelaide wants to take one of the girls to live with her, because she is nearsighted she doesn’t notice when the maid Evangeline goes in place of the children. While Evangeline is living with Adelaide, she learns how to read and carry herself with etiquette. Cedric nearly marries Mrs. Quickly, who is certain to be a wicked step-mother, but after wedding hijinx drive Mrs. Quickly off, Cedric finally notices Evangeline, who is dressed beautifully for the wedding. Evangeline finally catches Cedric’s eye once she is polite and beautiful, and is rewarded with a husband and financial stability for her change. 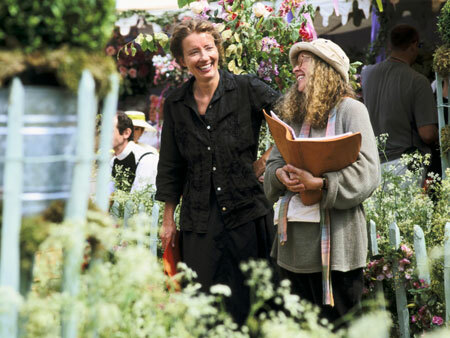 If Evangeline’s makeover weren’t enough to support the pretty is desirable theme in Nanny McPhee, Nanny McPhee herself goes through such a transformation. At the beginning of the film, she is a big woman with moles, a unibrow, and a snaggletooth. As the children learn their lessons, Nanny McPhee’s “ugly” traits begin to disappear. By the end of the movie, when the children learn to want Nanny McPhee although they no longer need her guidance, Nanny McPhee is both slender and beautiful. When the children didn’t want Nanny McPhee around at the beginning of the film (and it’s no wonder, given the cruel ways she punished them), Nanny McPhee embodied their dislike for her with an ugly face and fat waist. The last lesson of the movie was one I agreed with. Many of the conflicts in the movie would have been avoided if Cedric spent more time with his children, talking to them as people instead of sending them away when they wished to see him. Cedric learned to have an honest relationship with his children. Although it was refreshing to see a caring man as a protagonist, the one of the ways in which Cedric was nontraditionally masculine caused part of the problems for his family: he lived beyond his own financial means, and he was willing to marry for financial stability rather than love. In the end, it was women who constantly bailed Cedric out. He was unable to care for himself, and the women in his life had to support him so he could become a better father. 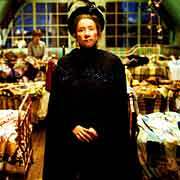 Nanny McPhee is illustrative of the greater, often unsaid expectations of children and women in this culture. The children’s world is defined by adults, and they’re punished for stepping out of it, much like women are punished for deviating from their gender roles. It’s even more telling that these subtle messages are in a children’s movie, where lessons on maintaining the status quo start young. Cross-posted on Feminist SF – The Blog! Archived Posts film and televison, gender caste, gender issues, masculinities. permalink. I think she’s choosing to make herself prettier to reward the children for behaving. Because obviously pretty women are wanted, she’s physically embodying the children’s feelings towards her. Maybe I’m going about it all wrong. Maybe instead of analyzing gender messages about women over at Hathor, I should stick to the ones the very same movies and shows give us about men. I.E., men can’t take care of themselves. Men can’t function without women. Men are horrible parents without women to guide them. Men are incapable of love unless women teach them. Men are so shallow, they can’t see inner beauty. Evangeline finally catches Cedricâ€™s eye once she is polite and beautiful, and is rewarded with a husband and financial stability for her change. When Evangeline walks into the Brown house, Cedric is the only one who knows instantly who she is. The children think that she’s “a fairy princess”; Cedric tells them that it’s Evangeline. When they say “Are you sure? She looks different,” he responds, “She’s always looked like that.” To Cedric, she’s always been beautiful, but it’s only when she becomes beautiful in the eyes of the world that she becomes marriageable. I thought the film was perhaps trying to comment on the ‘pretty=wanted’ trope as it prevails in society; Nanny McPhee and Evangeline become (or already are) beautiful in the eyes of those who love them, but socially they aren’t accepted until they are ‘objectively’ beautiful too. I don’t think that’s a reading that entirely holds up, though. mazaru, I’d forgotten that line (I think I was playing my DS at that point of the movie). That does redeem Cedric a bit in my eyes, although it’s a shame it took external acceptance for him to finally acknowledge his feelings for Evangeline. BetaCandy, I think you’ve listed plenty of reasons why men ought to be pissed about the messages about them in movies like this. I have a sudden and disconcerting urge to write an essay. I wish that we could get over the trope of beauty as shorthand for good, ugly as shorthand for bad, fat as shorthand for sea monster. Also, it’s another example of an unrealistically beautiful actress being made up to look ugly, because we certainly couldn’t have a woman who isn’t young and beautiful on the screen. Maybe…over at Hathor, I should [write about the messages] the very same movies and shows give us about men. Please do. Pretty, pretty, please! Give ’em a special tag and a special image at the top to set them apart or something.